Pierre Guariche, modernist, Frenchman, architect, decorator, designer. And an advocate of industrial production. He developed his models in the most rational and economical way, such as the Amsterdam chair. Designed in 1954, produced and launched in various versions by french furniture manufacturer Steiner. Its bold design is of rare airiness, the open gap between the seat and the bottom of the backrest contributes to the lightness of the lines, as do the compass feet. Pierre Guariche’s Amsterdam chair is sometimes referred to as „Tonneau“ because of its curved and enveloping seat. 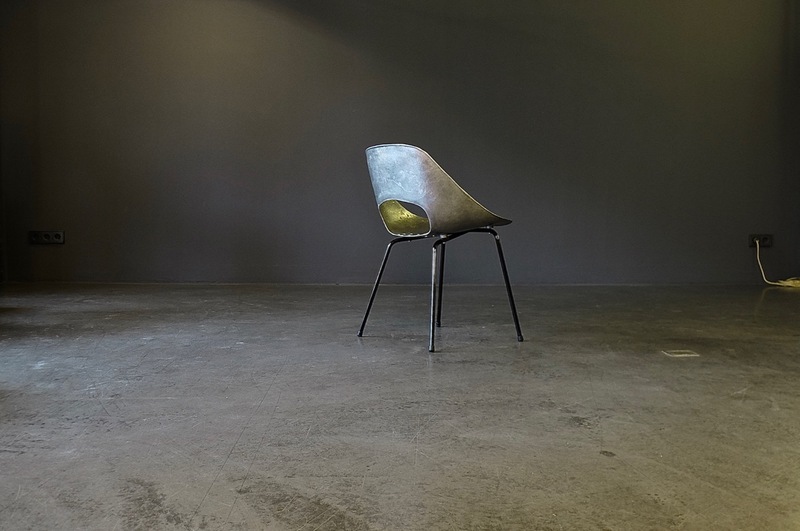 In our showroom finally we’ve got again an exemplar with the cast aluminium seat shell. This example was clearly used outside, recognizable by the holes in the seat that were added later, so rainwater doesn’t remain in the seat shell.